Dupree, Nancy. 80-655-4. Dupree Collection, Williams Afghan Media Project, Williams College, Williamstown, MA. H-00214-30. AMRC Collection, Williams Afghan Media Project, Williams College, Williamstown, MA. Kingruedi. "Evstafiev-afghan-apc-passes-russian." Digital image. Wikipedia Commons. Accessed September 5, 2010. http://commons.wikimedia.org/wiki/File:Evstafiev-afghan-apc-passes-russian.jpg. Q-00481-27. AMRC Collection, Williams Afghan Media Project, Williams College, Williamstown, MA. Q2-01290-06. AMRC Collection, Williams Afghan Media Project, Williams College, Williamstown, MA. Sl-06216. AMRC Collection, Williams Afghan Media Project, Williams College, Williamstown, MA. Stone Upon My Soul (Russian Propaganda Film Showing Soviet Withdrawal from Afghanistan). Salvaged and cleaned up by Gregory Whitmore. Williams Afghan Media Project, previously unpublished. The Soviet Union invaded Afghanistan in 1979. Ten years later, in 1989, they withdrew defeated. How did it come to this? After the Soviet invasion, there was prolonged fighting throughout the 1980s. 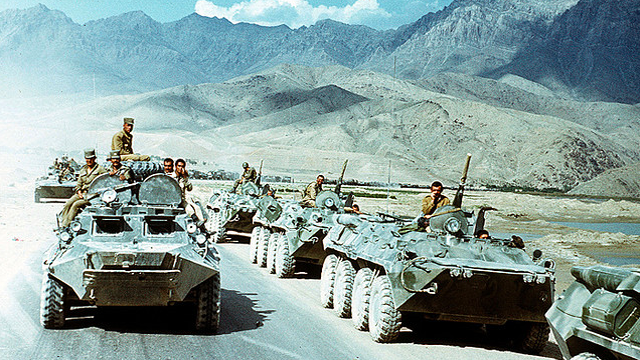 The Soviet-Afghan War was really a kind of stalemate—neither side could defeat the other. Eventually, a variety of factors ended the stalemate. One important one was the decision of the American government to provide stinger shoulder-launched surface-to-air missiles that neutralized the one big advantage that the Soviets had, which was their helicopters. And when they were neutralized, the Mujahiedeen began to take control of the countryside and really to push the Soviets into their bases and into the cities. Ultimately another advantage that the Mujahideen had was that they were going to stay longer than the Soviets were. And this coincided with a period where the Soviet Union was suffering severe economic consequences of their own internal problems, the war was unpopular and ultimately within a year after their departure from Afghanistan the Soviet Union began to break apart. The end result though was not the peace and prosperity that all had longed for. The freedom may have been won but it was won at a cost and what was left behind when the Soviets withdrew were a group of political parties, all of whom wanted power for themselves. over the oasis of Jalabad. in Shindad, Kandahar, and Begram. The Soviet Union invaded Afghanistan in 1979. Ten years later, they withdrew defeated. But what resulted was not the peace that everyone had hoped for.